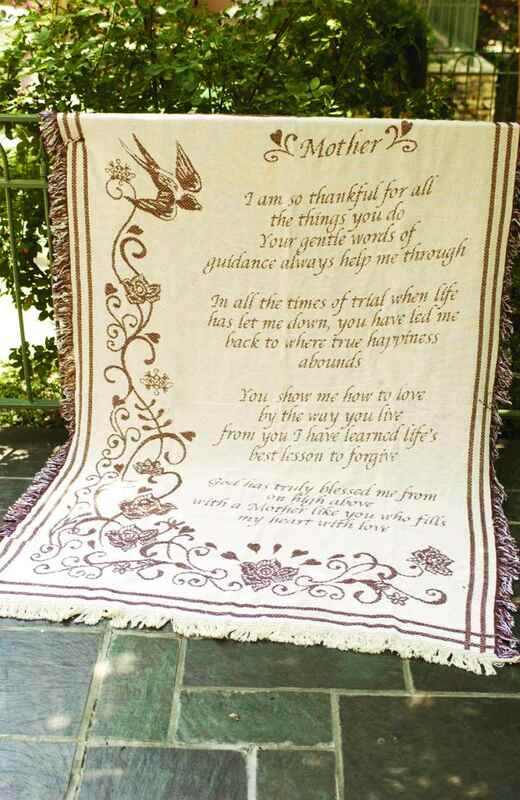 Fashionable Jacquared woven Mother Throw, 2-ply, 100% cotton throw with verse ~ 46" X 67" ~ " I am so thankful for all the things you do. Your gentle words of guidance always helped me through IN all the times of trial when life has let me down, you have lead me back to where true happiness abound You show me how to love by the way you live from you I have learned life best to forgive God has truly blessed me from on high above with a Mother like you who fills my heart with love " .. brown and creme with birds, hearts, and florals. Machine wash cold, tumble dry.